Dig and rip carpet, chew doorframes, try to escape? Injure her or himself? Lick constantly until sore? Whine, bark, howl when you leave? Your dog is not angry at you for leaving and getting back at you by destroying your belongings or damaging your home. As devastating as it is to come home to destruction or even injury, one can only imagine the fright, stress, and anxiety your companion is experiencing just because her favorite person isn't home. It's important to understand that not every dog that exhibits these behaviors actually has separation or isolation distress. Some dogs are clearly understimulated (mentally and physically), and some may not be completely chew or housetrained. However, if it is determined that your dog is presenting with isolation distress, I can help. With an appropriate behavior modification protocol and (often times) veterinary intervention, there can be a successful outcome. Working with isolation distress takes a lot of patience. 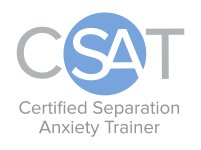 You'll agree to an initial time committment for the startup training, and as a CSAT (Certified Separation Anxiety Trainer), I'll commit to supporting and guiding you throughout the behavior-modification process. I will teach you about your dog's body language and what it tells you, and help you understand how that relates to your training program. With the use of online technology (webcams and smartphones), I'll monitor your dog in real time and give immediate feedback! Being part of a team dedicated to providing the best possible outcome for your dog, I have a network of certified separation anxiety trainers at the ready to answer the tougher questions and to suss out more complex cases. You truly couldn't be in better hands. I will get back to you via email (usually within 24-48 hours) with an available time slot to chat and get started. This phone chat will give you an overview of what to expect and should you decide to proceed with training, we'll schedule a more lengthy video phone consult and include a video assessment of your dog. Approximately 3 hours/per week of support via email, google spreadsheets, and Zoom "remote" conferencing sessions. Constant contact with me via google spreadsheets and email throughout the process. Initial video assessment and 4-week package are billed separately. All fees are paid in advance of services and can be invoiced via PayPal (to Friends and Family) or Zelle bank transfer for your convenience. Appointments are reserved only upon payment. Fees for Sep/Isolation Distress are billed separately from any other training/behavior services from Happy Tails Family Dog Training. *Should you take more than a week break in-between 4-week packages, another "initial" video assessment will be necessary and you will be charged at the $125 rate. If you do not already have one in place, you will need to purchase and set up a webcam to be able to monitor your dog in real time. This will be necessary once your dog has the ability to be alone. There are many wi-fi cameras available; some function better than others.